Why a whale watching tour Juneau is unlike wildlife viewing anywhere else. Juneau can be a fantastic vacation spot for people who love thrill and excitement. There are many countless things to do in Juneau Alaska for visitors to choose from: whale watching, fishing, hiking and tons of other activities that allow you to enjoy the amazing scenic beauty of the place. Juneau is the ultimate destination for every cruise line and a main port. This city has amazing views and gives all the goodness to residents and visitors. People of all ages enjoy whale watching in Juneau, as it is the one of the best spots in the world and certainly the best in Alaska. There are perhaps hundreds of exciting things to do in Juneau Alaska on a cruise adventure. Juneau has many tours for sightseeing, and with all the options it helps to have a guide to help you choose the perfect one and make your trip successful. There are city tours meant for land or water travel, however, a whale watching tour Juneau is the most famous of the port town’s offerings. Not convinced? Here is why Juneau is the Alaska whale watching destination. One of the biggest things that makes a whale watching tour Juneau an unparalleled and world-class adventure is its proximity to a number of different waterways. From Juneau’s cruise port, it is only a short drive to Auke Bay. Juneau itself sits on the Gastineau Channel. And the Lynn Canal is just beyond Auke Bay. The plethora of deep waterways plus the many islands they contain means there are dozens of prime spots where whales can hang out. Your captain is an expert at positioning the boat in prime viewing areas and spotting wildlife is part of your job, as well as his! Another reason that a whale watching tour Juneau is among the very best nature tours you’ll find is the sheer number of different wildlife sightings that can happen. On a whale watching tour Juneau, it’s possible to see orcas, humpback whales, Dall’s Porpoise, harbor seals, Stellar sea lions and other land based animals like bears and eagles. Juneau’s most wanted is of course the humpback whale and every single person is hoping to see them on their whale watching tour. 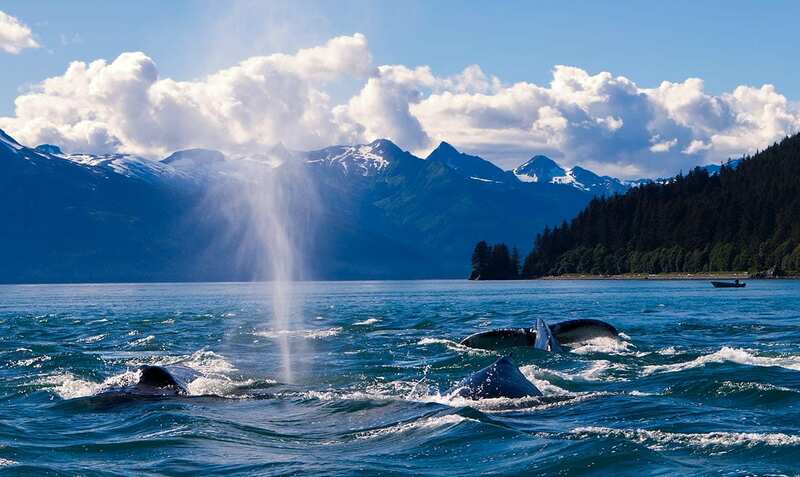 Humpback whales get into the ice cold water of Southeastern Alaska during the summer season mainly to feed. These whales have to migrate to the warmer southern region of the Pacific during the winter and adult humpbacks need a huge amount of food to sustain themselves. Spotting a humpback, you could say, is one of the most treasured and unforgettable things to do in Juneau Alaska! Most tours guarantee at least one whale sighting during your time on the water. But it is highly likely that you will see many, many more. The final thing that makes a whale watching tour Juneau the best of the best is the vast number of tour operators that exist in the city. From combination glacier and whale tours to customized catamarans built specifically for whale watching, Juneau has every kind of tour you can imagine. Several companies operate out of Auke Bay Harbor and have boats specifically designed for whale watching and you can get prime experience with ultimate whale watching. Most tours are approximately 4 hours long, which includes cruise and bus transfer. You are generally on the water for at least 2 hours. We say at least, because occasionally you will get waylaid by an curious pod of orcas who just won’t let you go! Your tour will take you by bus to the Bay, where you’ll board your boat. The boats have huge windows and often an outside viewing area as well. There will be a naturalist explaining everything to you in detail: the landscapes, the waterways, and of course, the whales. Whale watching is one of the things to do in Juneau Alaska that you simply shouldn’t miss. Alaska is the Land of the Midnight Sun, glaciers and wildlife. Getting out on the water in the presence of such beautiful areas and professional naturalists will make your trip worthwhile and you will not regret going on a whale watching tour in Juneau.